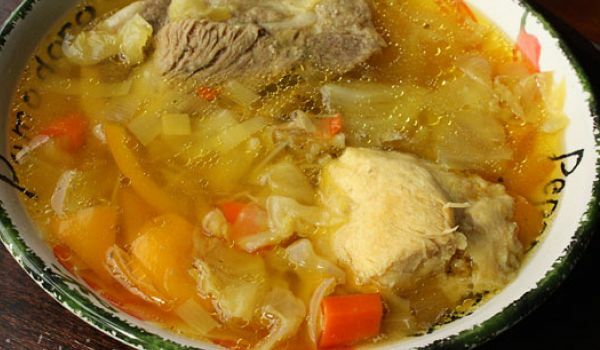 Chicken and Cabbage Soup is a very popular recipe. Learn how to make/prepare Chicken and Cabbage Soup by following this easy recipe. Place cabbage with some water in a pan and cook until tender. Strain it, reserving the stock. Combine chicken with some salted water in another pan and bring to a boil. Simmer on low flame, until meat turns tender. Strain and keep the stock and chicken separately. Remove the meat from the bones. Mix together cabbage stock, chicken stock, chicken pieces, vinegar, pepper powder, soy sauce, cornflour mixture, and ajinomoto into a large saucepan. Heat on low flame until just hot. Remove from heat and garnish with celery leaves.